The Earth is being bombarded with the radiation from the largest solar flare since October 2003. If you can see the aurora borealis, tonight is supposed to be a fantastic show. A solar eruption is followed by three separate waves. First comes electromagnetic radiation, which is followed by radiation in the form of protons (hurtling out of the sun at 150 million km/h), and then a corona mass ejection (plasma from the sun, which, for this eruption, will be travelling at a speed of 6.4 million km/h). The radiation took about an hour to reach Earth, but the protons are strewn between here and Jupiter and will not dissipate immediately, so the effects (aurora borealis) will last a couple of days. The plasma coronal mass is, apparently, only moderate, so there is no fear of electrical grid outages. Although it was noted that we “may” experience gps and power interruptions. This entry was posted in technology and tagged Aurora, Earth, Geomagnetic storm, Jupiter, NASA, National Oceanic and Atmospheric Administration, Solar flare, Sun by dimitri seneca snowden. Bookmark the permalink. 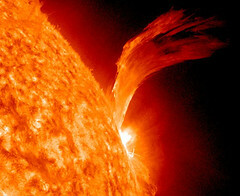 Pingback: 1/23/2012 — Earth directed — Large CME (coronal mass ejection) | 2012: What's the 'real' truth?